Data released from various agencies are compiled to this map. We update the map so that you may monitor the changing situation. The colored dots represent the average data of the amount of radiation measured at 10 am at each prefecture, and at the Fukushima Daiichi Nuclear Power Plant. In the world, there naturally exists radiation below 0.1 μSv/h all the time. It can be considered that a larger than usual radiation, such as radioactive Iodine 131 and Cesium 137, are derived from the nuclear power plants. Some locations on the map are chosen to see the daily change of radiation. In the map above, the radiation value larger than 0.35μSv/h is not distinguished, but in actuality, there are big differences. 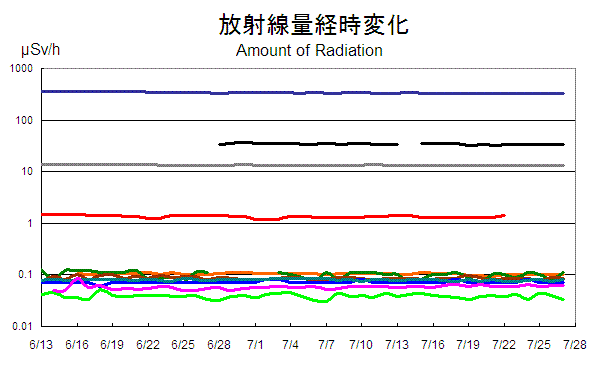 The radiation peak around the Fukushima Nuclear Power Plant followed by other places suggests the radioactive substances has been emitted into the air and spread to other areas. Logarithmic scaling is used on the vertical axis. Since June 13, we have shown the measured values at a height of 1 m from the ground around the monitoring posts by using portable survey meters at 10 am. Other than Fukushima and Miyagi prefecture: Ministry of Education, Culture, Sports, Science and Technology. How will radioactive substance emitted from the Fukushima Daiichi nuclear power plant spread? Various research agencies publish the forecast data based on simulation analysis. This animation is provided by Dr. Wotawa (Zentral Anstralt fuer Meteorologie und Geodynamik/ZAMG), predicting distribution of Iodine 131 over three days. 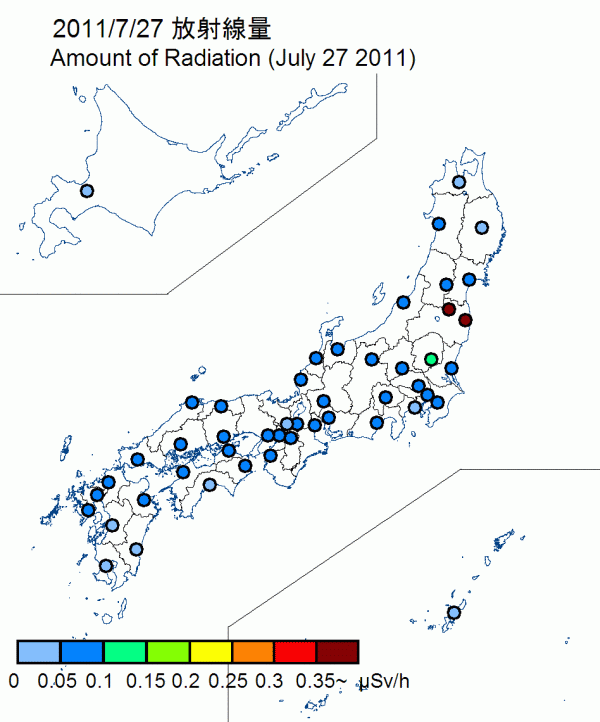 Expected radiation at the Fukushima Daiichi Nuclear Power Plant is 1. The predicted amount of Iodine 131 is shown in different colors, indicating the relative amount of the radioactive substance to that at the Fukushima Daiichi Nuclear Power Plant. It is unclear that what kinds of radioactive substances are released, and when and how much of those are emitted from Fukushima Daiichi Nuclear Power Plant. In this forecast, only Iodine 131 is assumed to be emitted with a constant emission rate. Then how the radioactive substance spreads out is simulated using weather data derived from European Centre for Medium-Range Weather Forecasts (ECMWF). (The ZAMG has discontinued the daily weather reports for Japan, especially for the crisis area Fukushima.